Ann and Dan live in the Boston area. At the time of their Feng Shui consultation, Ann was working in a high tech company. Dan is a physician. Ann wanted to use Feng Shui to create new directions in their lives since their children were finishing college and moving away. Their goal was to create a warm, welcoming space for themselves, their family and their friends with rooms that felt uncluttered but cozy. They wanted to spend more time together sharing interests and adventures. Ann wanted to explore new financial horizons or a new career. Their house had constricted energy so a major focus of our work together focused on opening up chi flow throughout the house. We concentrated especially on the entries, the living room and their studies. Balancing their elements: We identified and harmonized Ann and Dan’s individual elements in their shared spaces. In their studies, each needed her/his own elements enhanced. Bagua positions of Helpful Friends, Prosperity (Self Empowerment) and Self (Career) were emphasized. Balancing yin and yang The house had many straight lines, hard surfaces and bright white walls. We focused on ways to create yin (softening) through the use of throw pillows, curtains and warm-toned walls. To make the house more welcoming, the front door was repaired so that it didn’t stick. As the mouth of chi to the entire house, the door’s easy opening and closing drew chi into the house more successfully. A small fountain was placed in the hallway to keep the chi moving. Then, the front entry and hallway were redecorated to make them more appealing to visitors. Drawing people into the living room was accomplished by heightening the shared elements of Fire and Earth in the entry, pictured in this photograph. 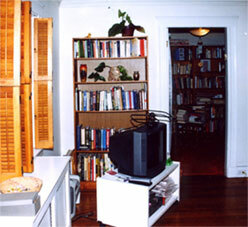 Ann and Dan’s studies were decluttered, reorganized and redecorated with functional, comfortable furniture. Warm-toned paint and carpets chosen to enhance their individual elements made both rooms practical and cozy. The relationship corner in their bedroom was enhanced by moving the clothes hamper to another location. In its place, we put an attractive cabinet to hold treasured items. The childrens’ rooms were updated to meet their adult needs and tastes as frequent out-of-town visitors. 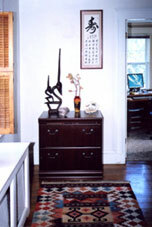 From Ann; “I feel that using Feng Shui principles played a significant role in making a major life transition fun. Our empty nest feels full again with shared interests, friends, travel and visits with our children. I found a new way to earn money and left my job. Now I can focus full-time on things that matter to me.